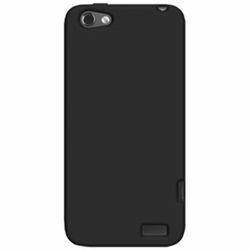 The Amzer Black Jelly Case is made out of 100% premium silicone and is a great, light-weight option for protecting your HTC One V. The durable silicone absorbs any shock your HTC One V may receive from any accidental drops or bumps, keeping it just like new. The smooth silicone gives you a sure and lasting grip on your HTC One V and minimizes sliding on flat surfaces. You have full access to your HTC One V without removing it from the case. The Jelly Case is truly like a second skin and a must have accessory. Fashionable & flexible Amzer Jelly Case for your new HTC One V.
Protect your HTC One V from accidental bumps. Provides a firm grip and prevents your HTC One V from sliding across your cars dashboard or angled surfaces. Protect your new HTC One V at all times. The Amzer Black Jelly Case is made out of 100% premium silicone and is a great, light-weight option for protecting your HTC One V. The durable silicone absorbs any shock your HTC One V may receive from any accidental drops or bumps, keeping it just like new. The smooth silicone gives you a sure and lasting grip on your HTC One V and minimizes sliding on flat surfaces. You have full access to your HTC One V without removing it from the case. The Jelly Case is truly like a second skin and a must have accessory. Features Fashionable & flexible Amzer Jelly Case for your new HTC One V. The Amzer Jelly Cases are made from durable premium silicone. Protect your HTC One V from accidental bumps. Provides a firm grip and prevents your HTC One V from sliding across your cars dashboard or angled surfaces. Its special anti-dust and scratch-free properties, preserves your phones shining look. Quality material used for this skin provides shield and avoid scratches. Helps to prevent your device from sliding on soft surfaces or angle surfaces. The revolutionary technology keeps dust away from the case. Precise cutouts give easy access to all the functionalities. This elegant skin-tight jelly case is perfectly manufactured to fit. Installation and removal are very easy. Protect your new HTC One V at all times. Available in different colors to match your personality and thought.